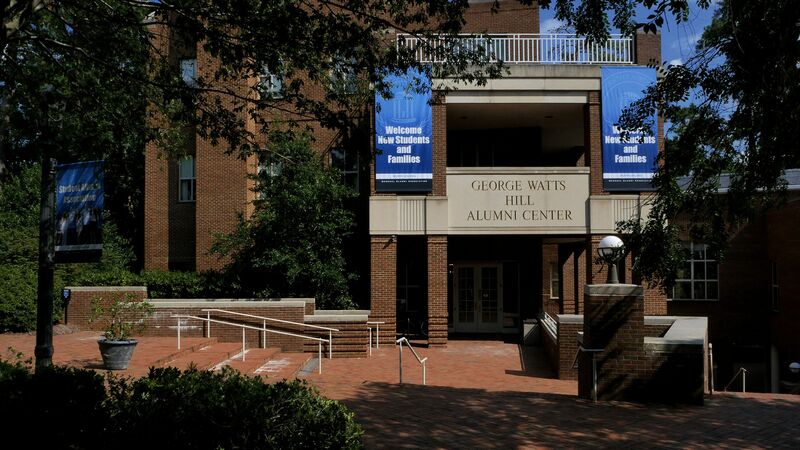 The George Watts Hill Alumni Center. The GAA has received five awards for its work from the Council for Advancement and Support of Education for the Southeastern district of the U.S. The GAA received a Grand Award in alumni relations for a series of timely programs, such as learning the Olympic ice sport of curling; an Oscars preview at a local theater, complete with blue carpet; a public forum about the NFL protests; a winter concert by the GAA-sponsored a cappella groups Clef Hangers and Loreleis; and a holiday event for families, featuring Santa in a Carolina blue suit. CASE also recognized two technological advances launched in 2018: a Grand Award in Mobile Application-Utility/Service for the UNC Alumni App; and an Award of Excellence in Online Experimentation/Innovation for online balloting in GAA Board of Directors elections. The Review received two Special Merit awards: Best Articles of the Year for “How to Mend a Sole,” in January/February 2018, about Chesca Colloredo-Mansfeld ’87 and Miracle Feet, her nonprofit that provides surgery to correct clubfoot in children around the world; and Illustration-Interior Spread for the July/August 2018 food issue. The awards were presented Monday at the CASE District III annual conference in Atlanta. The GAA has been recognized with 123 national or district CASE awards since 1996 — 59 for Alumni Programs, which includes 27 awards from CASE’s Affiliated Student Advancement Programs; two for Membership; and 62 for Alumni Communications. The University received several awards, including three for “BlueVBlue,” a 24-hour fundraising challenge between the business schools at UNC and Duke: Award of Excellence in Alumni Relations Fundraising Project, Event or Program; and Award of Excellence in Subunit Campaign, as well as a Special Merit award in the Subunit category for a video for the event. UNC received another Special Merit award in the Subunit category for its “Pave the Plaza” brick fundraising campaign and a Special Merit award in Annual Fund Publication for Be Part of Something BIG. Headquartered in Washington, D.C., CASE is a professional association serving educational institutions and the advancement professionals who work on their behalf in alumni relations, communications, development, marketing and allied areas.